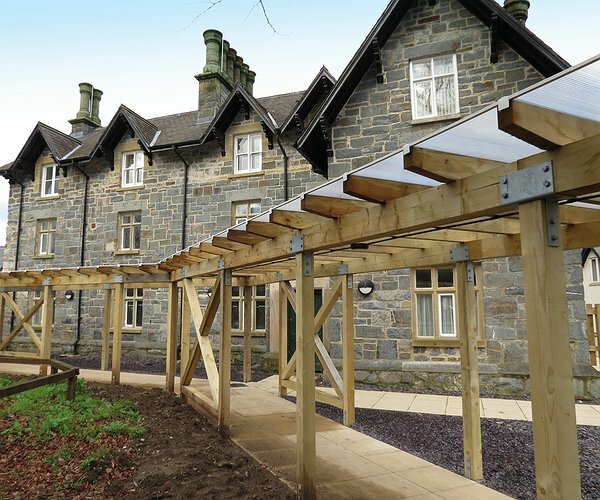 The ‘Hen Ysgol’ annex on School Bank road in Llanrwst – the old School Master’s House and ajoining buildings has been transformed into four new extra care apartments and ‘Yr Hwb Hen Ysgol’ a state-of-the-art rural health and wellbeing centre to be opened by Conwy County Borough Council in the New Year. New tenants at the Hafan Gwydir extra care housing scheme in Llanrwst have ‘gone back to school’ in style this week as they moved in to new apartments created as part of the transformation of the Old Grammar School buildings. The School Master’s House, a grade two listed building, and the adjoining library, hall and school rooms in School Bank Road, Llanrwst, have been completely remodelled and refurbished to provide ‘Hwb yr Hen Ysgol’ a state-of-the-art rural health and wellbeing leisure facility for the County, and four new apartments as an annex to the Hafan Gwydir scheme. The new tenants were welcomed on Friday by representatives from Clwyd Alyn Housing Association and Conwy County Borough Council. The development is a partnership initiative between the Housing Association, Local Authority and Welsh Government. “It’s an absolute privilege to meet with the tenants as they settle in to their new homes. It is very moving to hear from the residents themselves what a difference their new homes will make to them, giving them securing, peace-of mind and independence,” said Dr Sarah Horrocks, Chair of Clwyd Alyn. Mr Lloyd Jones, formerly of Pentrefoelas, said he is very happy in his new apartment and is looking forward to making new friends as part of the wider Hafan Gwydir and Llanrwst Community. Eirian Jones who has moved to one of the double apartments with her 83-year old Mum Rhiannon, already knows Hafan Gwydir well, not only because they come from Llanrwst, but also because Eirian made many friends working as a Domestic Assistant at the scheme until recently. Before retirement David Woodhouse worked as a school teacher as well as a nurse and social worker. Moving to the new Yr Hen Ysgol annex at Hafan Gwydir has helped to maintain his independence after three years of hospitalisation and a year of rehabilitation. The apartments at Yr Hen Ysgol are managed by Clwyd Alyn Housing Association, part of the Pennaf Housing Group, while Hwb Yr Hen Ysgol, the rural health and wellbeing leisure facility, will be managed by Conwy County Borough Council, when it opens on 6 January. The total cost of the new development is approximately £1.4 million. The apartments were funded via Welsh Government Social Housing Grant and Pennaf Private Funding. "First tenants move to new £10 m extra care scheme"